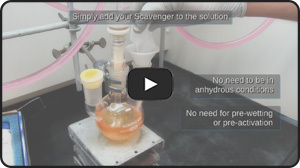 Share SiliCycle's Passion for Compound Purification with our New Scavengers Launch! SiliCycle delivers easier, cleaner, faster, more efficient purification processes using scavengers: those are silica gels functionalized with various molecules featuring scavenging properties toward different metals and / or organics. We name our metal scavengers SiliaMetS and our organic scavengers SiliaBond. You're invited to celebrate the launch of our 4 new Scavengers by sharing your most annoying, wicked impurity struggle at scavengers@silicycle.com. In processes that use a series of chemical reaction steps and various catalysts, the removal of reaction by-products - including metals, organics, metals & colour bodies - is critical to produce high quality pharmaceuticals or products. A large part of the production costs stem from downstream processings. Our main goal is to enable scientists to maximize their purification steps in an environmentally sustainable manner. We help our clients to achieve outstanding success across many industries: from pharma discovery labs to production plants, from universities to research centers, not forgetting semi-conductor production, mining, electronics, optical fibers industries and so on. Crystallization involves a compound exposed for a long time to high temperatures, increasing the risk for thermal degradation. It is expensive, and total recovery is hard to achieve. Solvent Extraction is long, implies large volumes of solvents, often implies colored and viscous extracts, and is hardly optimizable. Chromatography is effective but also very expensive, consumes large quantities of solvents (hence requiring further downstream processing) and poorly suitable for large scale operations. Tired of struggling with these kind of drawbacks? Silica scavengers combine the benefits of classical, century-old purification techniques while integrating new assets that are becoming more and more critical in modern industries. 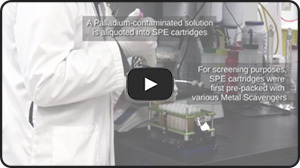 New purification procedures need to be more selective, more efficient, quicker and greener. 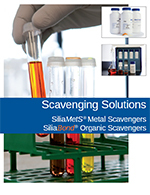 For an overview of all our Metal & Organic Scavengers, please order or download (login required) our FREE poster!